The Queen normally took little interest in her composers, being (according to the Duke of Manchester) ‘too busy or too careless to listen to her own band, and had no thought of hearing and paying new players however great their genius or vast their skill’. It is maybe surprising, therefore, that she granted Handel a pension of £200 a year for life. But the Queen’s health deteriorated, and by September 1714 Britain had a new monarch. Handel’s previous Hanoverian employer arrived in Britain, and one of the first engagements for the new George I was to attend morning service at the Chapel Royal where ‘a Te Deum was sung, composed by Mr Handel’. This seems to have been the ‘Queen Caroline’ setting, and Handel’s position with the new ruler appears to have been secured. The ‘Queen Caroline’ Te Deum was performed twice that year, first on September 26, and then again on October 17. It too looks back to Purcell in some of its construction, particularly the ‘Vouchsafe’ which has much in common with Purcell’s own 1694 setting of the same text. 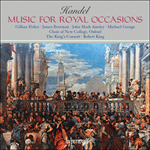 (Handel, though rude about many of his contemporaries, revered Purcell: at a performance of Jephtha he countered a remark that a passage reminded one of the listeners of Purcell with ‘If Purcell had lived, he would have composed better music than this’). But Handel’s Te Deum also shows the influence of the opera (in which he was already proving a great success), particularly in the tenor aria ‘The glorious company’, and the lyrical aria for alto and solo flute ‘When thou tookest upon thee’. To thee all angels cry aloud. Thou did’st not abhor the Virgin’s womb. Thou did’st open the Kingdom of Heaven to all believers. Make them to be number’d with thy Saints in glory everlasting. O Lord, save thy people and bless thy heritage. And we worship thy name for ever world without end.